Getting the perfect beard sounds like it will involve quite a bit of skill. Either on your part or the part of your barber. However, if you want to use a mens beard trimmer at home then with a little help from this guide you will achieve beard grooming mastery. It is not difficult when you have the right tools, especially. In this article we will take a look at two different brands who make great mens beard trimmers for home use or professionals. I will pit Andis and Panasonic head to head in a brand match up to see which one is best. For one, they have years behind them in the beard and hair grooming market. Andis is a favorite among barbers all over the world. They make very affordable professional mens beard trimmers. Reliable, durable and efficient, they are a great choice for any new barber. But, what about for home use? The really nice part about Andis is that they are very affordable, even if you only plan to use them at home. With some other professional brands, it is not a cost effective way to manage your beard grooming. They have really dialed in on beard and hair grooming products for the home. Using the latest technology they’ve made it easy for people to give themselves a professional cut without any previous know how. So, which mens beard trimmers by these iconic brands are best? I picked the best beard trimmer of the respective brands. Which one is best is going to be decided by what your beard is like and what your grooming plan is. But, the match up is between the ER-GB40-S Panasonic beard trimmer and the Slimline Pro Andis beard trimmer. Let’s go into the details of each. What you get with the Andis Slimline Pro is a professional clipper at a DIYer budget price. Sure, it’s more expensive than some other mens beard trimmers out there, but not that much more. At 6000 spm, or strokes per minute, you get quite a bit of cutting power from a small beard trimmer. Again, this is a professional mens beard trimmer so you can cut through any kind of beard hair. Have a big, burly beard that you want to cut down to stubble? No problem. It will cut right through it like it was nothing. What I really love is the rotary motor. Most Andis trimmers have an electromagnetic motor that rocks the arm that connects the blade. This makes a racket and also heats up the body and blade in a short time. Not the case with a powerful rotary motor. With two hours of runtime, the Slimline can give you many trims before you need to recharge it. Charge time is only 2 hours and 15 minutes, so when you need to charge it, at least it doesn’t take all day. The downside is that it can’t be used corded if you do find yourself with a dead battery. The charging base has a small profile and takes up little space on a bathroom sink or vanity. Besides the aforementioned charging dock, the trimmer comes with four plastic comb attachments. 1/16″, 1/8″, 1/4″, 3/8″. So you can go right down to stubble at the lowest and leave it a hair under a half inch at the longest. This might prove to be too short even at the longest for some guys that like to keep a longer beard. If you do have a long beard and want to keep it long, but trim it back a bit, you can use the trimmer to freehand it or use a comb and run the trimmer over it. That takes a bit of practice to get right, though. The ergonomics of the Slimline make it very easy to use and maneuver. This is ideal for new barbers or somebody trimming their beard at home. They are lightweight and balanced so you can really get them into any angle you need. Being cordless gives you another big advantage in that the cord won’t be getting in the way as you try to trim your beard. If you are a new barber and just getting your tool set together, then this Andis beard trimmer is a great choice for you. You’ll get some clean lines and trimming the beard is super easy and convenient. If you are trimming your own beard at home, then I recommend these if you plan to keep your beard short. It works really well at lining up your beard and hairline and you can even zero gap the blade so it can be used as an electric shaver. With a long beard, and little trimming experience with trimmer of comb technique, then you may want to look elsewhere since the attachments that come with it won’t be suitable for keeping your beard long. If you think you can tackle trimming freehand then this is a very good choice. Overall, this is a very good trimmer that will last a long time and get the job done no matter what you throw at it. 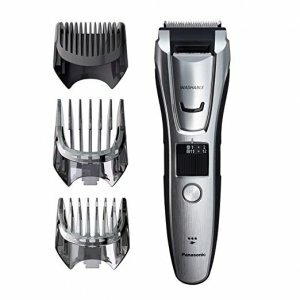 Panasonic has a large selection of mens beard trimmers, but to me the only one that is worth looking at is the ER-GB80-S. It is so easy to use, with so much versatility and a great design that doing your beard yourself is no longer a chore. More than just to make it look pretty, the design is one of the features that makes this such a great beard trimmer. First off, the blades are set at a 45° for just the right cutting angle. This will cut down a lot on pulling the hair and help to avoid needing to run the trimmers over the same spot multiple times. Using a zoom wheel to adjust the length with 39 different settings is as simple as it gets. No more fumbling around in your carrying case looking for the right length comb attachment. The zoom wheel is conveniently located so you can just use your thumb to adjust, keeping it a one handed operation. Especially handy if you are trying to handle a mirror at the same time. Then it is weighted towards the head to make it perfectly balanced. A rubberized grip will keep the Panasonic beard trimmer firmly in your hand. The blades, in addition to the optimal angle for cutting, are very sharp. They are also designed with a curved tooth to reduce irritation on the skin. To take advantage of all the 39 different lengths, you will also need to pop on one of the three plastic comb attachments. To get your beard between 1 and 10mm you will need comb A. Then another for 10 to 20mm and a third to use in sensitive areas like the pubic area or under arms at 1.5mm. Without the combs, you can get the blade down to 0.5mm for a length slightly above stubble. There is also a detail trimmer that pops up to help line up your beard and hairline. You get 50 minutes of continuous battery run time per full charge. Not the best time, admittedly, but definitely enough to cover several grooming sessions. There is an LED light showing how much battery life is left so you don’t get caught with a dead trimmer on your hands. If by some chance you forget to charge it, you can use it corded at least. Charging only takes an hour to get the battery back to full. This Panasonic beard trimmer is great for the guy that wants to groom his beard at home. With so much versatility, you can groom your beard short, keep it long and even taper it into your hairline. Edging the beard is simple with the detail trimmer and having 39 length settings means an accurate trim all around. As a bonus, it also works great as a body groomer so you are sure to get a lot of use out of it. If you want versatility that is very easy to use, then I would pick this over the Andis beard trimmer. Especially if you want to leave your beard a bit longer. Since the two beard trimmer work a bit differently, I should go over how to use them rather than do a general guide. Before you get started, have an idea of how you want the beard shaped and how short you want it. You don’t want to wing it as you may end up with a beard that is not what you were going for. Start by deciding where you want the edges. On the cheeks, just where the hairs get a bit patchy, you can use the trimmer without the guard and get a nice crisp line. Make sure you’re using a mirror and looking straight ahead so both sides are even. Under your chin, mark off where you’re going to start the line by going two fingers above the Adam’s apple. Then make a straight line towards the ear lobe with the trimmer blade. Do the same for the other side and you have a nicely edged beard. Once your beard is lined up, now decide how long you want to leave the beard. If you want it short then pop on one of the plastic combs and just go over the beard, starting at the bottom. Go against the the direction that the hair grows in and then comb it down again. You may need to go over it twice, but this Slimline is pretty powerful and likely will cut it all evenly the first pass. You may want to taper it into the hairline, in which case you will use progressively shorter comb attachments until it blends into the haircut. After you are done, wipe off the blade with a brush, making sure to get all the hairs off. Hair is acidic and will cause the blade to get dull if you don’t keep it free of hair. Then add a couple of drops of oil to the blades and let it run for a couple of seconds. Your Andis beard trimmers come with clipper oil, and most other brands include it with their trimmers, too. The beginning of the last section holds just as true as when you use the Panasonic. Judge where you want the edge of the beard and how long you think you want to keep it. Use the detail edger to line the beard up. This is not nearly as sharp as the Andis, so you may only be able to set where the line is which you may need to use a razor to clean up afterwards. Once your beard is lined up, then determine the best length. The best part about the Panasonic beard trimmers is the zoom wheel to adjust the length for when you want certain parts of the beard long. For instance, if you want the chin and mustache longer and then get progressively shorter as you get closer to the hairline, then set the trimmer to the longest setting. You can adjust it by 0.5 mm increments to make a nice smooth transition. Only work in about one inch sections and then change the length and continue. Again, start at the bottom, and the longest length and work your way up. Once you have finished, then rinse the blade under the faucet to get all of the hair off the blade. Now that you have the right tool in the mens beard trimmer and understand how to use a beard trimmer, you can have the beard of your dreams! It doesn’t end there, though, now you need to treat it with some good beard oil and make sure you brush or comb it. You can’t have a nice beard without a proper beard grooming routine, so your job is only half done by trimming it. With great beard comes great responsibility so make sure you’re taking care of it. Got any tips for your bearded brothers out there? Let us know by dropping a comment in the box below.